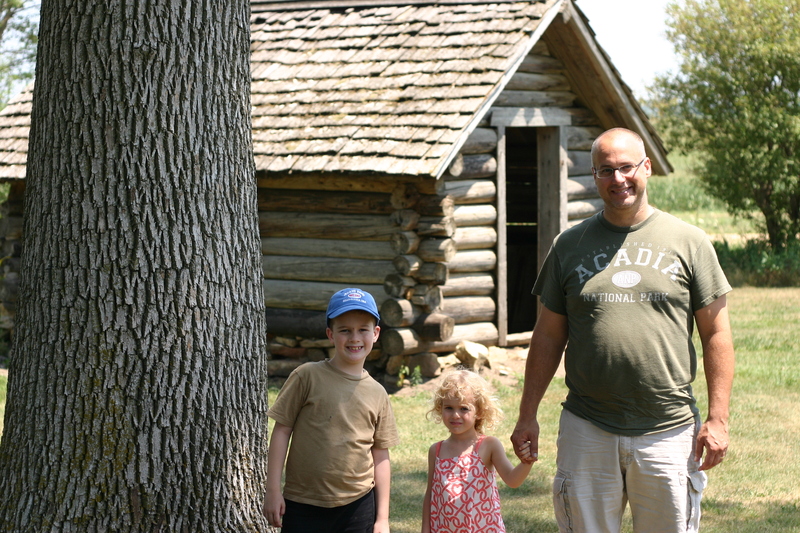 At the start of the summer, on one of our little weekend getaways, the four of us sat down and made a list of things we wanted to do this season. Summer always seems to go so fast, and we’re likely to let it get away from us if we’re not careful. But we’ve found that by creating a wish list we’re more likely to actually get around to doing some of the fun things we thought up and less likely to forget. Like visiting random historic sites. Last weekend we realized that summer was once again passing right before our eyes and decided it was time to attack making Cornish hens (which was at the top of our “foods to make” list). We invited some friends for dinner and set to work. A co-worker had recently mentioned a recipe for smoked Cornish hens and I knew that’s what I wanted to do. We found our inspiration in a recipe from the Neelys over at the Food Network. We started by creating a dry rub. I opened up the spice cabinet and just went to town. I knew I wanted to use some cardamom and then went from there… onion powder, sage, rosemary, sugar, cinnamon, salt and white pepper. We patted the hens thoroughly with the dry rub and let them sit for about an hour. 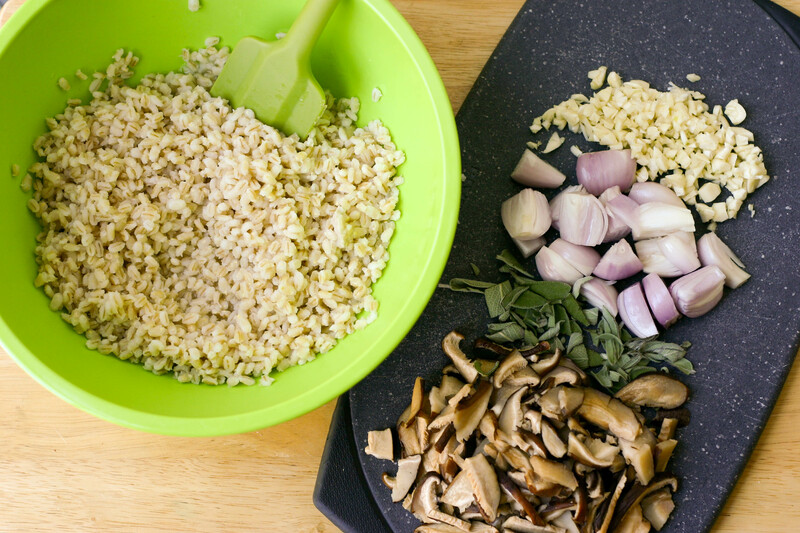 In the meantime, we prepared a stuffing with barley, mushrooms, shallots, sage and garlic. 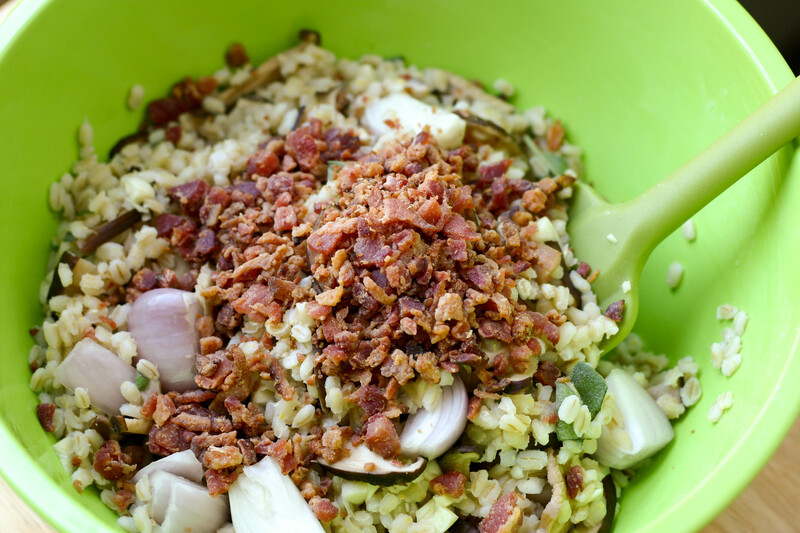 Then we threw in some crumbled bacon for good measure. 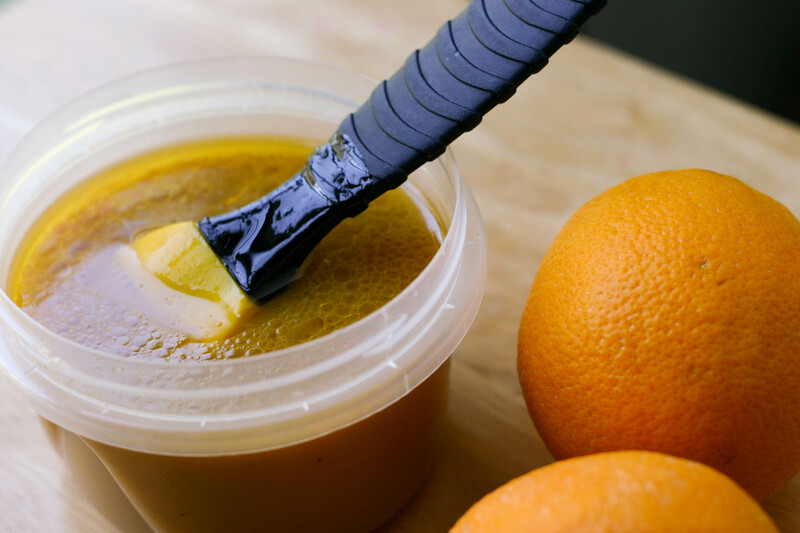 Next we used the Neelys’ recipe to create a basting glaze which incorporates shallots, butter, chicken broth, orange juice and apple cider vinegar. When the birds finished resting with the spices, we stuffed them up and placed them on the grill. Mike maintained the smoker at 250F. After grilling for about 30 minutes, he basted the hens with the sauce. He continued basting every 15 minutes for about another hour. Miss A kept asking when the baby chickens would be ready to eat. I can’t blame her…the smoky aroma had us all chomping at the bit. 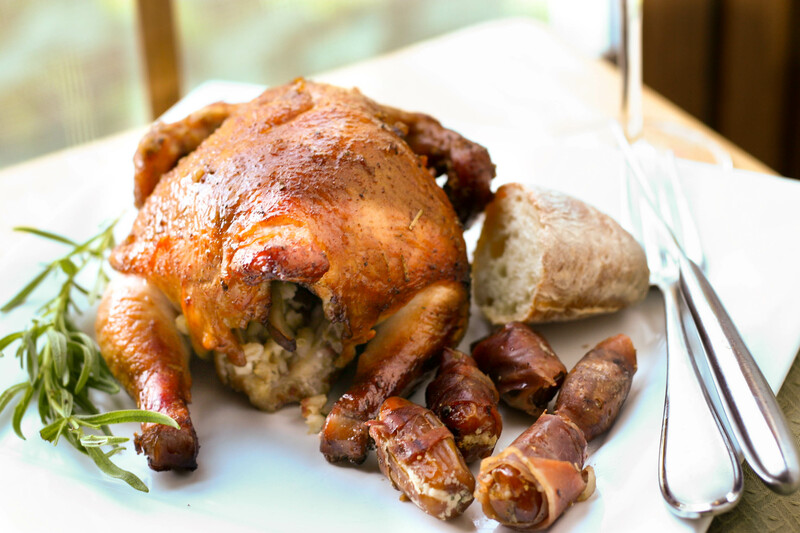 Once the hens were cooked through, we let them rest and then served them alongside crusty bread and some of the prosciutto wrapped dates. The Cornish hens were juicy, tender and wonderfully flavorful. They were a big hit with our friends and with all of us. Mike and I gave the smoked Cornish hens a strong 3 spoons. Mike felt a more traditional stuffing would have been his preference. I enjoyed the stuffing and my only complaint was that I wish I had made some more to serve on the side. 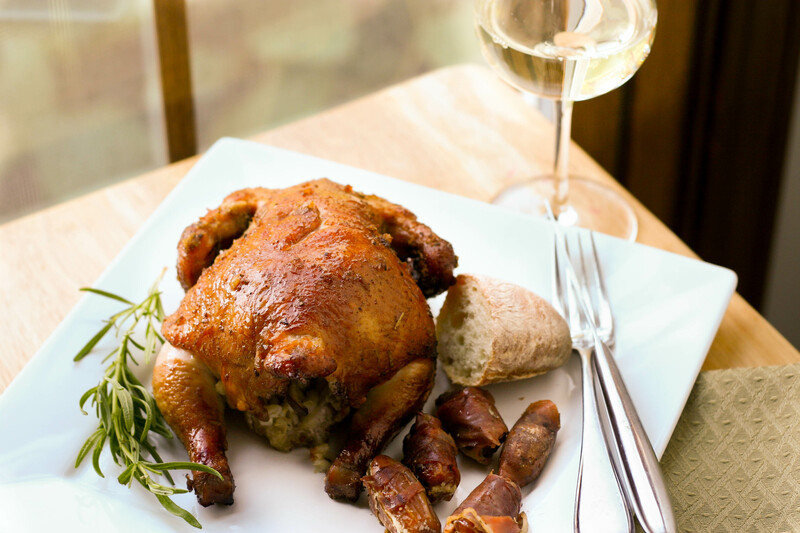 A Cornish hen doesn’t hold much stuffing. Miss A gave her “baby chicken” 3 spoons; although she wouldn’t touch the stuffing. Mr. N gave the hens 3 spoons too, but also gave the skin 4 spoons. He loved the bites with the crispy, herb laden skin. Who wouldn’t?! I have to admit that was my favorite part too. It was a great evening with good friends, wonderful food, crisp wine, a little tennis and an impromptu glow stick show by Mr. N and Miss A after the sun went down. A perfect summer night. And we definitely had more than enough hens to go around, so were able to freeze some for a fast meal once school starts up again. It will be nice to have a little taste of summer later this fall. Until then…we have a few more things to check off our summer to-do list and a bit more monkey around to do! 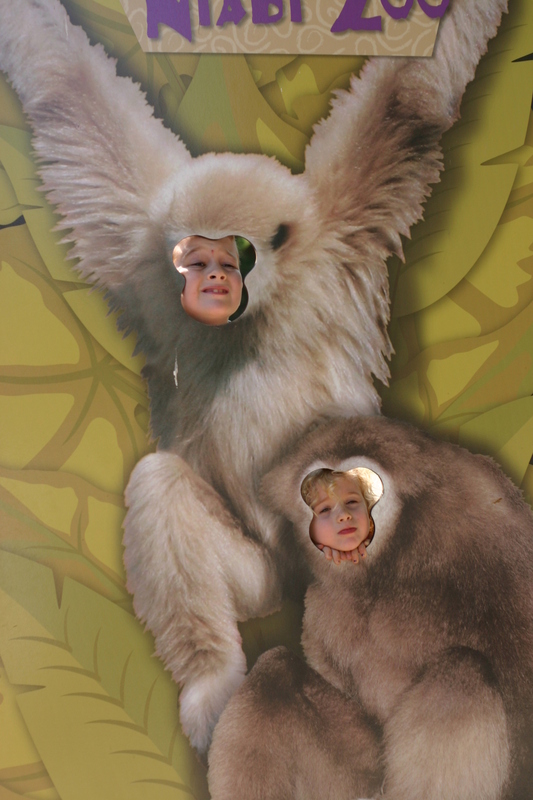 Summer fun at another new zoo. I was a little confused until I went to the recipe. I thought I would need a smoker for this recipe but you used a grill and must have a smoker box. The little hens sound very good. You guys are so cute!! Perfect family! Your cornish hens sound incredibly delicious. I’ll take 2. Your family eats so well and I want to be your 3rd child! 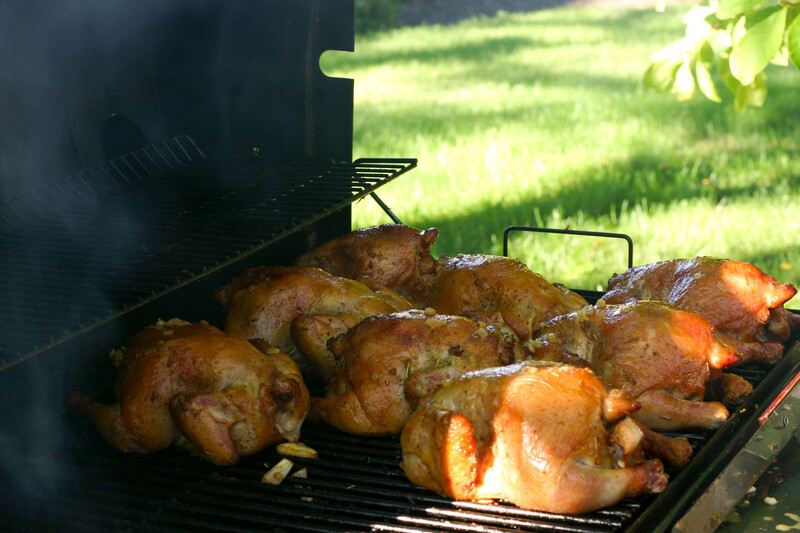 I really wish to have a smoker… I think we’ll be eating a lot of smoked food! Look amazing and delicious! Great idea to make your list as a family! Summer really does fly by too quickly. The stuffing is my favourite part — so I can see why that was your only complaint! 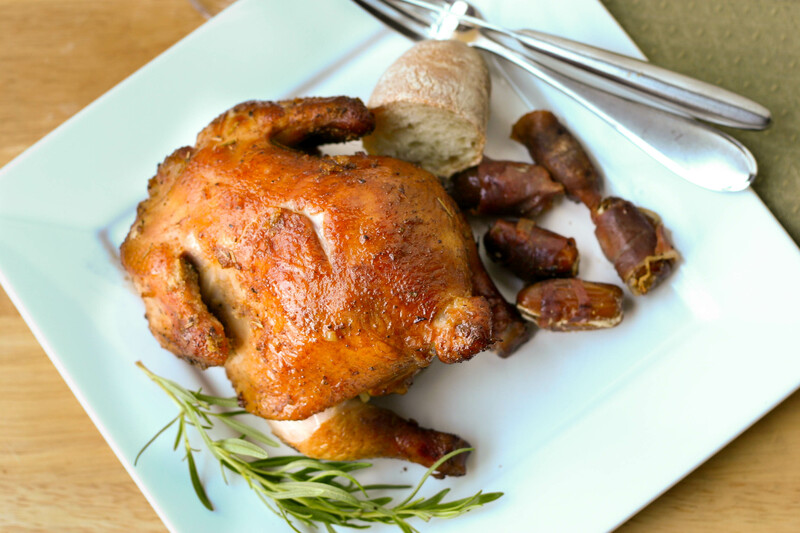 Now making cornish hens is on my list! We’re heading to a cottage for a week, so I’m going to keep an eye out for them! Enjoy the last couple weeks of summer! Hi Kristy, I’ve always wondered – how many people does a Cornish Hen serve? Is it supposed to be one per person, or does one split them up? I’ve actually never eaten one! Do they differ a lot from chickens? 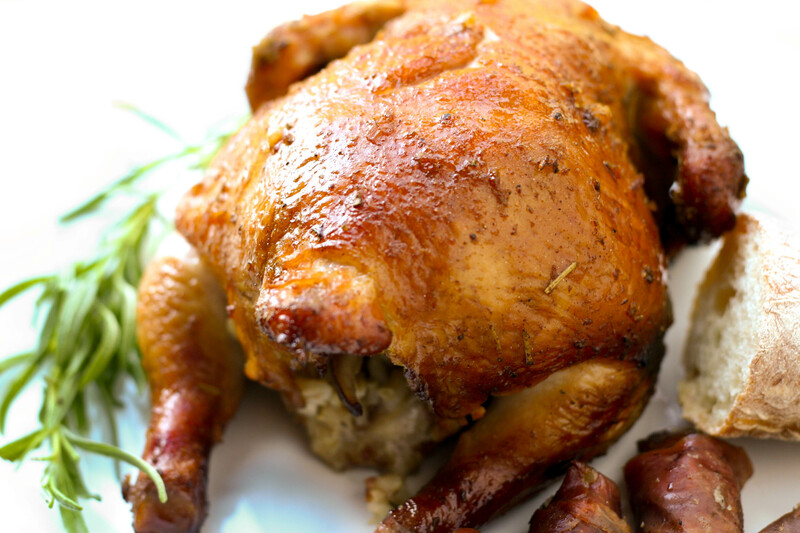 I love, love, LOVE cornish hens, but for some reason don’t cook them very often. They are elegant, tasty, always make a meal special! thanks for the inspiration, and… loved the last photo! Too cute! 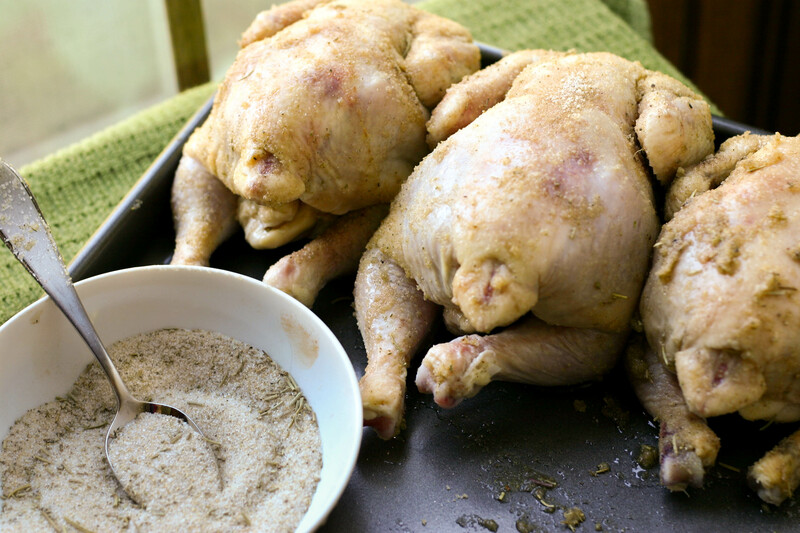 Cornish hens look amazing! I love the stuffing inside it. Your rub sounds full of exotic flavor! I would have never thought to add a touch of sugar. I will have to give it a try sometime. The birds turned out gorgeous…no wonder Miss A. was anxious to eat them. I’m always a little melancholy when the end of summer arrives. This meal would certainly cheer me up. Such beautiful smoked hens. I can just imagine the aroma, if I were your neighbour I would be in your backyard. The cornish hens look fabulous! Such a clever idea to write down what you want to do – I write everything down otherwise nothing gets done. Wow the stuffing alone makes me hungry. Bacon and mushrooms in a chicken, yummy! That’s a great main course for a barbecue, Kristy. That orange glaze sure did make those hens look good coming off the grill. Good to hear the taste was equally good. I use the same “technique” when I make my spice rubs. Open the door to the spice cabinet and just start adding to the mix. I can’t believe I actually used to buy it! Looks delicious, you know how I love smoked meat!! I can’t believe that summer is almost over, it feels like it just got going here… Glad to see you finally got WordAds loaded!! 🙂 And I agree, I’m not ready for summer to be done yet. Hopefully we’ll get a good fall. Huh…I had never heard of spatchcocks before. They do sound similar. The Cornish hens are about 1 to 2 pounds. I loved the color of the birds too – so colorful and crispy. I would have loved to be a guest at YOUR party and be served one of those cornish hens. I bet they were amazing tasting with all those spices and herbs in the rub.